The Telegraph Media Group has released its first Apple iPad application, featuring the best editorial content from both the Daily Telegraph and the Sunday Telegraph. The free application allows people to stay in touch with all the latest news, sport and weather – as well as all the other key sections such as business, comment and features. The app will download the paper from 5am every day and features a 'simple and easy navigation' and (our favourite bit) a Matt cartoon on the front page. 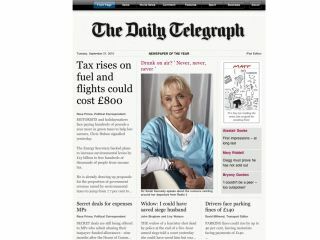 Edward Roussel, Digital Editor, Telegraph Media Group (TMG): "We are delighted that iPad users will be able to enjoy the best journalism fromThe Daily Telegraph andThe Sunday Telegraph. "This development demonstrates TMG's dedication to making its content accessible to the widest possible audience on all key platforms." TMG is also working on an updated iPhone app and another iPad app in conjunction with US paper the New York Times.